Manko, Gold, Katcher & Fox Participated in the Clean Air Run - Women's Team Places First and Men's Team Places Fourth! 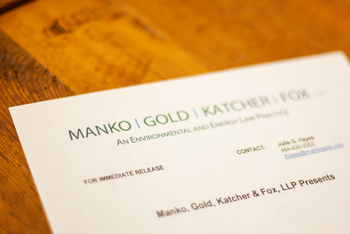 Philadelphia, PA (May 6, 2010) - Attorneys and staff from the environmental, energy and land use law firm of Manko, Gold, Katcher & Fox, LLP recently competed in the Clean Air Run, held in Philadelphia. The women's team placed first and the men's team placed fourth in their respective divisions of the 5K race.